Interior visual project in Kapitan Petko Voyvoda Primary School in Galata, Varna, 2013. 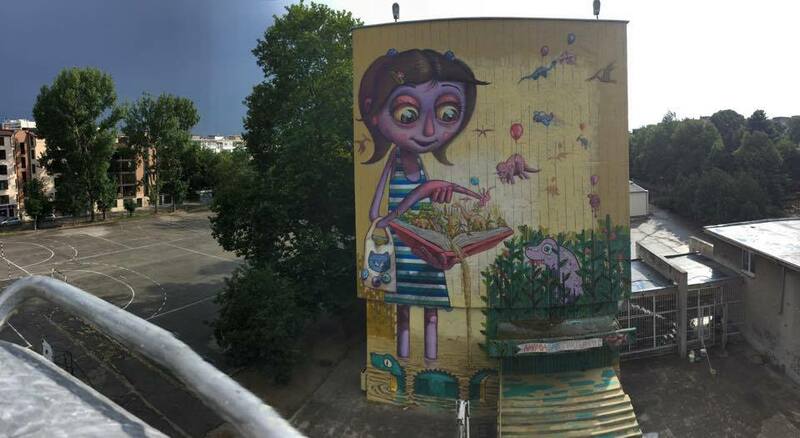 In 2015, in a collaboration project with the French Institute and its local representation, Amorpha invited artists to create their original joint mural projects at three outstanding venues: Centre Francophone de Varna, Fifth Language High School in Varna and Le PAVILLON du Dr PIERRE in Paris, France. Archigraff Lighthouse Graffiti 2014 (part of Archigraff project for collaboration between graffiti/street artists and young architects). Shabla Lighthouse Graffiti 2011, 2012, 2013. Amorpha’s urban art initiatives include also international and local artist joint and solo exhibitions, sketch contests, formal discussions and informal meetings and workshops all aimed at supporting the development of the graffiti and street art scene and its artists of all skill levels (from wannabes to professionals). These activities also have an important social work aspect as work with the young artists often includes strengthening key social competences and self-awareness. Archigraff (2013 – ) – collaboration between mural artists and young architects. The initiatives includes an ongoing series of events such as introduction and working meetings; development of joint projects between the most experienced Bulgarian mural artists and young architects consulted by prominent local architects of different generations; presentations of painting materials and techniques, history of urban art, architectural heritage; public discussions on urban planning, urban arts and architecture; mural and joint project exhibitions at the house of architects and an architecture university department. Partners to the initiative are the Union of Bulgarian Architects and the House of Bulgarian Architects in Varna, and Varna Free University – Department of Architecture and Urban Studies. In 2013, Amorpha participated at the local stage of the Bloomberg Competition with a developed concept for the method of introducing and renewing large-scale murals into the city as part of its cultural strategy for contemporary artistic development and citizen involvement.